Polarity analysis (PA) is a development of Boenninghausen's concept of contraindications. It serves to determine in individual disease a healing probability for each homeopathic medicine in question. The method leads to an efficient and reproducible choice of remedy and increases the precision of prescriptions as compared to a conventional homeopathic procedure (figure 1) Polarity analysis is based on Boenninghausens Therapeutic Pocketbook 1846, an exceedingly reliable repertory. Polarity analysis is generally practiced with computer software (see column on the right). 50 patients with three or more diseases were homeopathically treated over 12 months using polarity analysis. 86% of them achieve an improvement (based on their personal rating) of at least 80% or more – the average improvement is 91%. In the reference group with one single disease treated by conventional homeopathy, 86% of the patients reach an average personal improvement rating of 78%. The Polarity Analysis software is available at http://polarity-analysis.com and can be tested free of charge. Try to solve every case study on this site with the help of the software, beginning with the case of acute otitis media, followed by the tendonitis calcarea, then the multimorbid patient, and finally the ADHD child. Obtain the book Polarity Analysis, a Precise Path to the Simillimum (Narayana Publishers, 2013), and work through all the modules. For this purpose you need to use the Polarity Analysis application . Begin treating your own acutely ill patients. You need to encourage your patients to accurately observe their symptoms. For this purpose they can download the Checklist of reliable Symptoms, and prepare it at home before coming to your practice. When you feel comfortable treating acute disease, proceed to chronic disease, and later to multimorbidity. Finally you can move onto the more difficult field of ADD / ADHD treatment. Now all you need is practice, so try to treat as many patients as possible to familiarize yourself with the subtleties of symptom selection for repertorisation. This takes some time to perfect, but you will be rewarded with good results and satisfied patients early in the learning process. 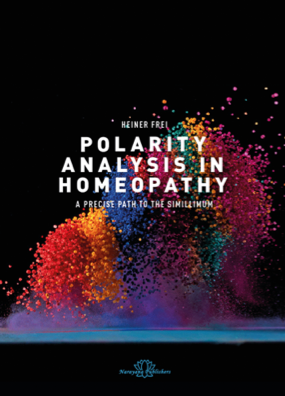 Please Note: For optimal results do not mix Polarity Analysis with other homeopathic methods. and it contains new gradings of polar symptoms derived from many successful cases. The division of the symptoms in three reliability groups (high, medium, low) leads to precise prescriptions. The Polarity Analysis program is available at http://polarity-analysis.com and can be tested free of charge. This book introduces you to the method of polarity analysis and provides numerous case studies of acute and chronic disease, psychiatric disorders, ADHD as well as multimorbid illness. The case studies illustrate the method and provide an opportunity to learn polarity analysis step-by-step with practical exercises. The checklists and questionnaires included can be used by readers to implement the procedure in their own practices. Several outcome studies demonstrate the effectiveness of the method.